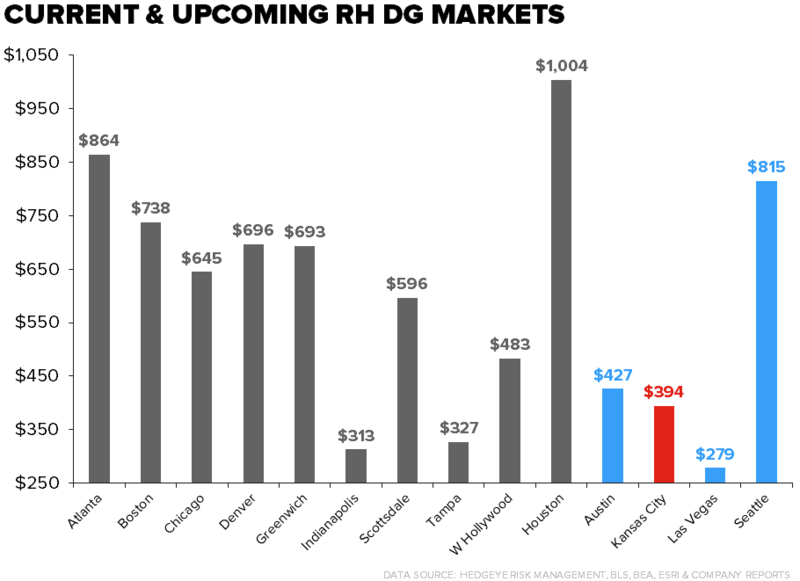 Takeaway: RH building some positive momentum. 1st - Gary buying stock, now first new store opening in 2016. After about 7 months of nothing but bad news for RH, the company is finally building some positive momentum. It started two weeks ago with CEO, Gary Friedman, making his first public market purchase since the Fall of 2014, and was followed up by the announcement that the company would be opening its newest next generation in Kansas City during the first week of August. At ~55k gross sq. ft. with an additional 10k sq. ft. in outdoor selling sq. ft. this is the first new door of the four promised that the company will open in FY16. We still are expecting plenty of choppiness over the next 6-12 months for the company, as it irons out the Gray Card program, fixes the supply chain, and rationalizes its SKU count. But, the combination of Gary buying stock and then the company inviting the Street to one of its gala events where people can nit-pick management sounds like at least a hint of confidence to us. At a minimum, it suggests that things certainly are not getting worse. 1) This is the 2nd store the company will have finished by early August. KC in addition to the Austin door that is sitting and waiting for the rest of the development to be finished up. That leaves two additional doors the company needs to bring to the goal line to hit the 4 store target the company set. The two additional markets = Seattle and Las Vegas. Compared to prior years, the timeline for real estate is favorable with two projects out of the way by early August. Of course, each market and project is on an independent time line, but given the head start the company has in 2016, additional HQ resources can be focused on completing the opening calendar for this year and the new batch for 2017. 2) At just south of $400mm, the Kansas City/Leawood market is the 3rd smallest the company has tapped for a Design Gallery. Tampa was the first in the big format in a smaller market back in Nov. 2015, and Indy was a first generation store with a footprint of ~15k sq. ft. and opened in 2013. 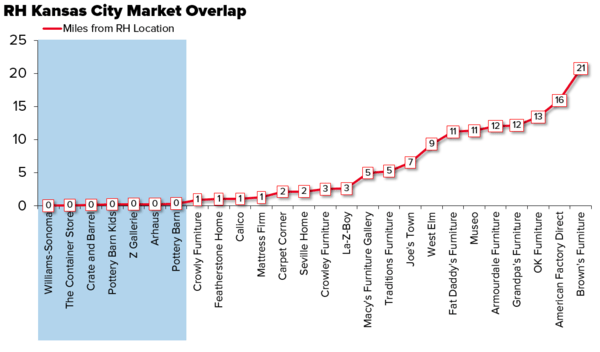 The key here is that there is a precedent for a big format store in a lower population density market, and by all accounts (mostly anecdotal) the Tampa door along with the rest of the Next-Gen Design Gallery fleet has performed at or above plan. 3) The KC market demographics are more favorable than those of Tampa and Indy, with 22% of the population inside the TAM (which we define as households making over $100k/year in income). The average household income at $73k has a 14% and 6% premium respectively to the markets cited above. Don’t get us wrong that’s a far cry from the 50% TAM rate in Greenwich, CT and $143k avg household income number, but we think the buffer here is the rent profile on the store. The ideal situation for RH, we think, would be to have its Full Gen model in every market, but the fact is that there are a few markets where the economics don’t work – we say a few markets because RH went through a 5 year stretch of culling its footprint. But, the buffer is the rent profile. We don’t have the specifics on the KC market, but given the absence of any meaningful sq. ft. growers for the REIT’s to choose from, and the repurposing of a failed restaurant concept to a 3 level RH – we’ll assume that the math on the store is Denver-esque (i.e. Incredibly favorably). 4) With its new store, RH is now in furniture Alley. There was a little competition in its Legacy Store at Country Club Plaza – mainly West Elm, but in the new property RH is smack dab in the middle of Arhaus, Crate & Barrel, PB, etc. (see chart below for distance in miles to competition). What does that mean…a) RH doesn’t have to work too hard to generate additional foot traffic for the category, the shopping center is already a destination for Furniture, b) given the positioning of the real estate (external vs. internal mall) and the size and scale of both the footprint and product relative to the rest of the competitive set we think RH can take considerable share as long as the company continues to get the right product in its doors, and c) lastly, RH will be lined up against these 'competitors' offering better product at lower prices. This market is likely to end up being a case study for people wanting to compare price/value positioning. CHART OF THE DAY: The Beta Chase Is On!